On the last day of 2015, before he was to greet the new year, Mr Nicholas Tan, 48, lost his job. His company, an electronics multinational, had shut down its Singapore operations, causing about 300 people to be jobless, including Mr Tan, who was the marketing manager for the Asia-Pacific region. Initially, he looked for a similar role in the same industry, but months of failure forced him to lower his expectations to include executive-level roles as well. "I thought, with my experience, I could get a job easily, but I was wrong. After four months, I got more and more demoralised." He sent out about 70 job applications but received only two replies. He did not get the jobs after the interviews. Finally, in May, he landed a job as a regional product sales manager at a local electronics firm - on the recommendation of a friend. He struggled to adapt to a smaller company, so he attended a P-Max programme under the SkillsFuture initiative, which helped him understand the work practices better. 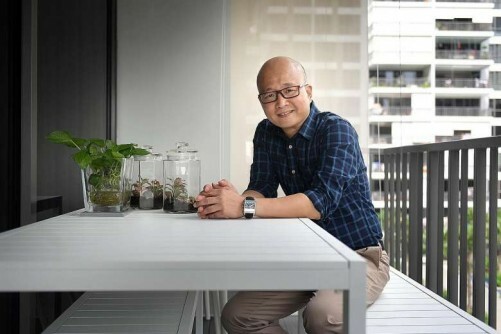 The experience has convinced Mr Tan that PMETs like him "must accept that the job market has changed". He said: "(We must) lower our expectations, or retrain ourselves to move into a different job." Professionals, managers, executives and technicians, or PMETs, form an unusually large proportion of those asked to go as businesses restructure. Official figures released yesterday show that PMETs comprise 72 per cent of local residents made redundant. This is far higher than their share of 55 per cent of the resident workforce, excluding full-time national servicemen. They were mainly displaced from the professional services and financial and insurance services industries, based on figures from the Manpower Ministry. For non-PMETs, among clerical, sales and services workers, the most redundancies were in the wholesale and retail trade. Among production and related workers, the most redundancies were in manufacturing. Locals were less vulnerable to layoffs than foreigners: Of the 19,170 workers who lost their jobs last year, 8,090, or 42 per cent, were foreigners, higher than their one-third share of the workforce. Returning to the job market was also tough. 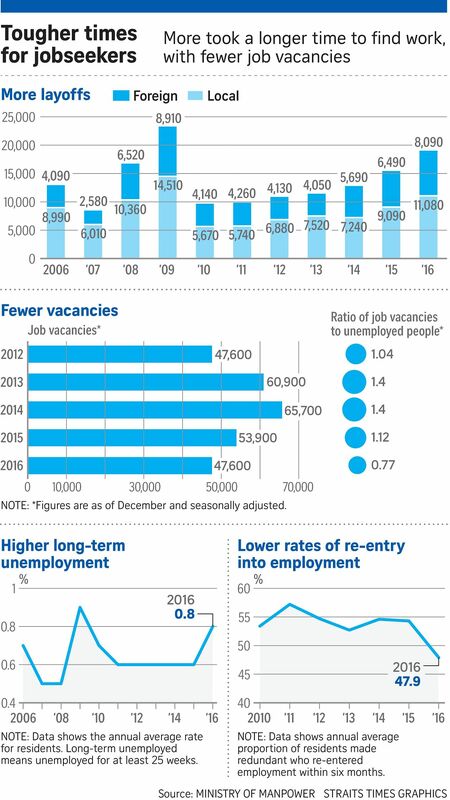 The proportion of residents who got a job within six months was 47.9 per cent on average, the first time in at least seven years that it fell below 50 per cent. PMETs and degree holders fared worse than average, with re-entry rates of 43.9 per cent and 42.5 per cent respectively. DBS economist Irvin Seah said this group is particularly affected as industries like financial services are driven by external demand, making them more volatile than industries employing more lower- skilled local workers. "Education should no longer be just about degrees but about skill sets, life skills and building resilience," he said. There are several programmes to help job seekers. These include enhanced Adapt and Grow schemes to help them overcome job mismatches in the labour market as the economy restructures. People long unemployed can tap the Career Support Programme for PMETs or the Work Trial programme for rank-and-file workers. Both will offer added salary subsidies from next month, especially to employers who hire Singaporeans out of work for at least a year. A new Attach and Train scheme will help workers get training while on attachment in sunrise industries that have yet to hire actively. The labour movement's new Pivot programme offers vulnerable professionals greater peer support. Said labour MP Patrick Tay: "I urge workers and employers to tap all these schemes and embrace the changes before the change (overwhelms) them."